"Can I try that?" I asked the tired husband with my finger pointing to a picture of black stone bowl holding some assorted ingredients, that looked like raw vegetables and egg. "Whatever! Am ordering a thali meal from the indian counter" replied a visibly irritated husband. He had every reason to get annoyed as it was our second week in Japan and I almost wanted to try out new things every time we went out. More often than not I could not finish the dish because of some ingredient unknown to me and we had to go up and order yet another burger from MacD. But that day was not the same. The Dolsot Bibimbap that I got afterwards was delicious to boot. While ordering I requested them to poach the egg and while serving they gestured me to handle the blisteringly hot stone bowl carefully. The meal that followed afterwards was like an one pot wonder. It had everything from Crunchy sauteed vegetables, marinated pickle, stir fried sprouts, Little bit of meat, one fried egg with a shiny orange yolk and a big dollop of gochujang, a Korean spicy chili paste that brings all the flavour, texture and taste together. We literally licked the bowl clean and went back the next day for another serving. Bibimbap is a Korean dish which literally means "mixed rice" where a small bowlful of rice is topped with individual servings of various vegetables, pickles, meat, Egg and a spicy sauce. Mostly the ingredients are very lightly sauteed to keep its taste and crunch intact and are presented in an aesthetically appealing manner. One is expected to mix everything together before eating. 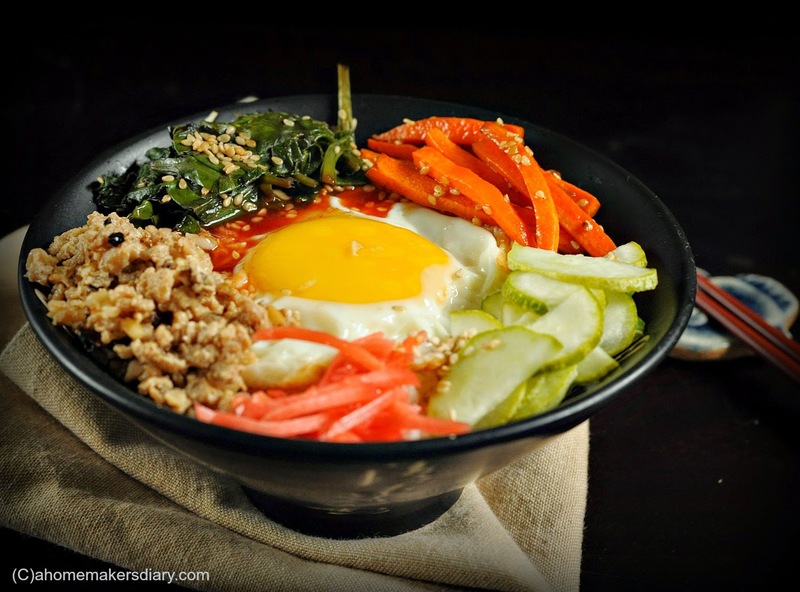 The more traditional way of Eating the Bibimbap is from a stone bowl called Dolsot. The bowl is heated and the same ingredients are accompanied with a raw egg yolk. Once everything is mixed together you are supposed to let it stand for 5 minutes for the rice and egg yolk to get cooked together from the heat of the bowl. The rice that touches the bottom and side of the bowl becomes crunchy and offers great texture to the dish. In regular Korean households this dish is often served to use up all the leftover side dishes but in restaurants or especially in the Jeonju province, being a part of the royal cuisine this is served with more items. some restaurants even serve it with minimum 30 accompaniments. You can see the reason why from Bill Clinton to Michael Jackson is so crazy about Bibimbap. Its not only fun to mix everything but is one of the very nutritious meal that you can serve your family. After that night this is one of my go to recipes which I serve guilt free. Its hassle free, quick and well balanced. Put the rice to boil and prepare the accompaniments. By the time rice is done you are ready to serve the meal. Using this recipe as starting point you can serve it anyways that suits your requirements. Genrally Shitake mushrooms, marinated cucumber and radish and sauteed sprouts are an integral part of bibimbap. But no one will take offence if you omit those. Just make sure to serve a spicy sauce along with it or a bowl of hot broth like the Japanese do. I dint have access to authentic gochujang so followed this recipe to make my sauce. My Bibimbap is no way authentic but yet it carries all the flavour and more importantly the essence of a balanced aesthetically presented meal. For us this is the perfect TV dinner. Whenever we are watching movie or catching up the latest Masterchef Australia serial we love to have this. Try making this for the FIFA world cup final night with lots of grilled meat for your man and watch him squeak with joy. Bring a bowlful of water to a rolling boil. Dunk the spinach in it. Cook for a minute and take out. Wash under cold water. place in a colander to drain excess water. Peel and cut the carrots in long batons. Peel and do the same to the radish. Wash and discard the ends of the cucumber. Cut lengthwise and then finely slice in half moon shape. In a glass bowl mix 2 tbsp water, 2 tbsp vinegar, 1 tsp sugar and 1/2 tsp salt. Mix to dissolve the sugar. Add the cucumber pieces in it. Mix and keep aside for 10 minutes. Use this method to pickle any vegetable like radish, onion, ginger etc. Heat 1 tsp of oil and add the minced garlic. Stir and add the minced chicken, 1 tsp light soy sauce, 1/4 tsp vinegar, pinch of salt and stir on medium heat. Cook till the juice from the chicken dries up (3-4 minutes). Take out and keep warm. Heat 1/3 tsp oil and add the carrot sticks, 1/2 tsp soy sauce. Stir on high heat for a minute. sprinkle some sesame seeds and take out. Heat 1/2 tsp oil and add the spinach with 1/2 tsp soy sauce and a pinch of salt. Cook on high for a minute, sprnkle and mix sesame seeds and take out. Mix everything for the sauce. Taste and adjust the seasoning. Just before you are ready to serve prepare the egg. Heat 1/2 tsp oil in a frying pan, preferably a non-stick one. Let it heat up or you will end up with scrambled egg. break an egg in the center of the pan. Sprinkle little salt and pepper powder if you wish. Let the white firm up a little bit and then using a spatula slide it on top of the rice as mentioned in the next step. Take a deep flat bowl. Add 1/2 cup cooked rice and press to flatten the top. Place the poached egg in the center and all other ingredients along its side. you can anyways dunk everything together but Bibimbap definitely looks better when aesthetically appealing. Place a big spoonful of the sauce on the top and a final sprinkling of roasted sesame seeds for extra crunch. with time I have realised the importance of the egg in this dish. The yolk actually bring everything together and is a great part of the sauce. Now there definitely is a proportion of quantity of rice and number of eggs. 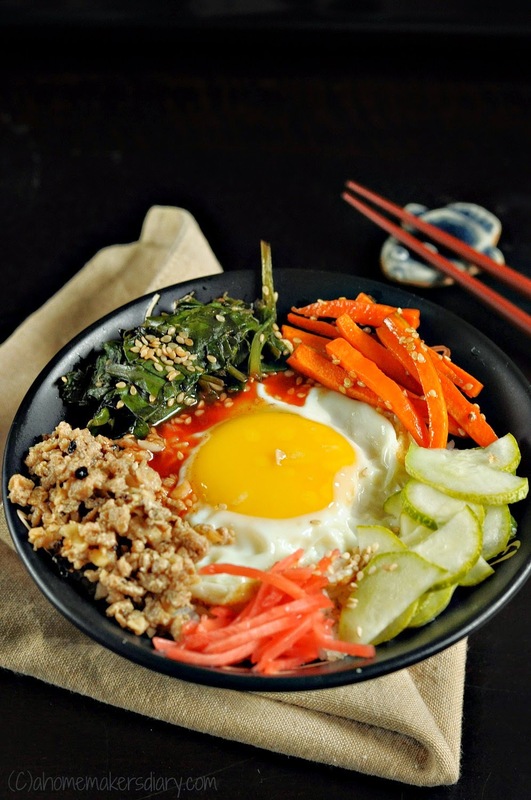 The traditional bibimbap do not serve much of rice and hence one egg is enough to bring the taste. 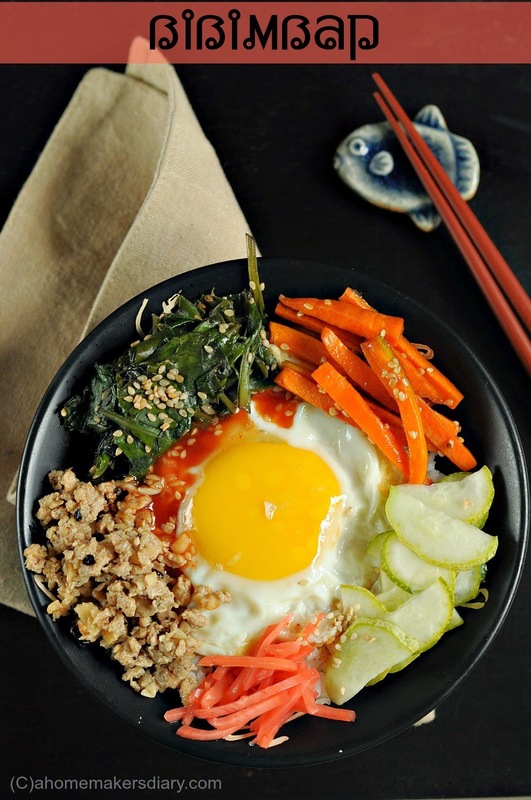 If you have any big eater in the family you might consider increasing the number of eggs in his bowl for that true Bibimbap experience. The number of things one can top the bowl with is numerous. Tru sauteed bean sprouts (just a minute), sauteed mushrooms (again not more than a minute), baby corn, Fried Tofu, Bar b qued pieces of meat etc. I here have used readymade Japanese young ginger pickle called Beni Shoga that a friend brought for us. Try using any other type of pickle for that crunch and tartness. When I was in South Korea this was my favourite dsh.. I love this yummy..
What a colorful bowl ! I am definitely going to look for it, the next time we visit a Korean place. such a colourful bowl of delicious spread...who could ever say no to it..love it..
Lovely medley of veggies, Bibimbap looks fabulous and quite filling, heard lot about it but never had a chance to taste it. Korean rice meal looks delicious I will make it when I get some time.